What mysterious structures appear on the sky? This thread is meant to solicit other such structures on the sky that have been imaged, thought about at least a bit, but no consensus as to its cause has yet been formed. If you know of such a structure, please mention it in a reply to this post. Thanks for contributing, if you can. Re: What mysterious structures appear on the sky? Well, just a few off the top of my head... Perhaps these have already been demystified, I don't know. I'm intrigued by the red dragonfly with yellow wings at the base of the waterfall in today's pic. 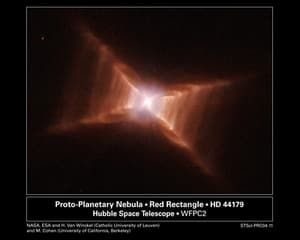 Is it a red jet emerging from a star? To Answer SAM - Reply with quoteRe: What mysterious structures appear on the sky? I'm going to Guess that it is something similar to this APOD. I don't know much about astronomy, but the waterfall suggests an edge to me. Some kind of... shock wave? RJN wrote: The APOD for 2011 October 24 depicted the Waterfall Nebula, a structure that appears on the sky that is not well understood. observed in front (the larger tail and its brightest feeding jet side pointing down on left side , as well in the opposite far end (partially hidden) on the right side). arXiv:astro-ph/0501403, GRBs-SN and SGR-X-Pulsar as blazing Jets, D. F.
arXiv:astro-ph/0307348, Rebrightening in GRBs by Precessing Jet, D.F. Following astronomy is a hobby of mine and not my main thing, but todays entry really intrigued me because I love the mysterious - especially in our own Universe. And this image is intriguing - yes, because the source of the oddly shaped gas stream- but also because that isn't the only unexplained or mysterious thing in the picture. The link provided in the text talks about the star that SJB mentioned. The link says it's shooting "energetic bullets of high energy particles." Why would a star only be shooting these in only one direction? Is this completely unique to this specific star or has this been observed elsewhere? And then there is the waterfall structure itself. Are the colors unusual due to gaseous composition or simply because it's pretty? And the source? A nonthermal radio source seems to mean electrons moving very close to the speed of light in a strong magnetic field indicating that whatever this source is it is incredibly powerful. We're talking black hole, galactic center, quasar powerful. These sort of radio waves are found where massive stars have exploded. Oh yeah- something happened here - or is happening here. The mystery seems to lie in the case of the missing X-rays. Again, I'm no expert, but I'm pretty sure we find X-rays in all of those previously mentioned phenomena. But none here. Really? We are talking about electrons practically riding the speed barrier on a strong magnetic current - and nothing of significant force that has been found in the galaxy truly fits the bill. I mean, what other non-thermal radiation occurs around non-X-ray emitting centers? Is there anything comparable? How likely is it that one of those things could truly be existing without X-ray emission? And what makes this environment so unique that X-rays wouldn't be emitted around this non-thermal source where everywhere else they seem to be found? I think the most interesting aspect about this picture is the alleged source from the text in the image. It's clearly the brightest spot of the waterfall. It almost seems that the waterfall flows out of both sides of this origin. This radio-source is seemingly the origin of the waterfall. Finally - at the bottom of the waterfall - is that gas from the waterfall meeting with the highly energized "bullet" electrons from the star 1500 light years away? Because that is just super sweet. This image is awesome. Some of the Astronomy mysteries, at risk of sounding "sci -fi"....cause me to wonder if a time warp is involved. The Waterfall being one. One of my own favorite "weird structures" is a background galaxy that appears in the field of M51 and its companion galaxy, NGC 5195. The galaxy I refer to can be seen in this picture by Adam Block. The galaxy is located "straight below" NGC 5195 in this image. The galaxy looks like a "blue handlebar inside a bubble". Ann wrote: One of my own favorite "weird structures" is a background galaxy that appears in the field of M51 and its companion galaxy, NGC 5195. The galaxy I refer to can be seen in this picture by Adam Block. The galaxy is located "straight below" NGC 5195 in this image. The galaxy looks like a "blue handlebar inside a bubble". Hmm... on my screen it looks more like a white dog bone(a little bigger on both ends)no blue at all.